Resurrected Bites cafe at St Marks Church was launched in January by Michelle Hayes, who works at the church and spearheads Zero Carbon Harrogates food group. A Harrogate cafe that operates on a ‘pay as you feel’ basis and provides a practical solution to food waste will soon celebrate its first year of serving the community. Resurrected Bites cafe at St Mark’s Church was launched in January by Michelle Hayes, who works at the church and spearheads Zero Carbon Harrogate’s food group. Committed to addressing food waste and raising awareness of the carbon footprint involved with food production and waste, Zero Carbon Harrogate’s food group intercepts food that shops, cafes and supermarkets can no longer use, and transforms it into nutritious meals that are then served up at Resurrected Bites. An estimated 5,000 customers have eaten at the cafe this year, and a minimum of 10 per cent of the ‘pay as you feel’ donations are given to a different charity each month. So far, more than £2,100 has been allocated to 13 charities. Michelle said: “The cafe has been a huge success, with many regular customers who love the diverse range of tasty food that is served. 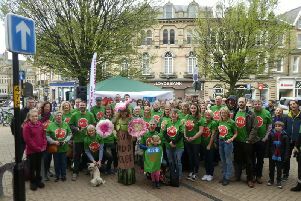 Suppliers are happier too, with several expressing their delight that the food they can no longer use is being put to good use in feeding bellies not bins.” Zero Carbon Harrogate’s aim is to help the Harrogate district become net-zero carbon by 2035. The Resurrected Bites team has prevented a whopping 9,000kg of food from going to landfill this year, and Michelle estimates that by intercepting this food waste, the cafe has saved around 17,100kg of CO2, which is the amount of C02 that an average household produces from their electricity usage in four years. The cafe cites reports from the UN that if global food waste was a country, it would be the third largest greenhouse gas emitter after the US and China. Resurrected Bites has been a big success in its first year, and its volunteers are hoping for an even bigger and better 2019. The first Resurrected Bites cafe of 2019 is on January 9, when volunteers will be marking the cafe’s first birthday, from 10am to 2pm at St Mark’s Church. The team invites Harrogate residents to come and join in with the celebrations. The Full of Beans creche will also be open from 12pm to 2pm. Email news@harrogateadvertiser.co.uk to share your Harrogate news.